AFC - 09/23/11 Let's Go Green! Animal Friends started, under the sposorship of the City of Zagreb, a long-running campaign Green Monday. In this way it has joined an international campaign, currently implemented in more than 20 countries around the world and keeps growing. The goal of the campaign is to help people improve their health and the health of their environment by switching to a plant based diet at least one day a week. This simple message enables everyone to enrich their table with their favorite plant based dishes and to explore the benefits of the meatless diet for their health. A plant based diet is healthy, good for animals and for our planet, it helps reduce world hunger and it is very tasty! All these reasons have attracted Renata Sopek, a famous television host and a promotor of fitness and healthy diet and lilfestyle, to participate in the campaign. 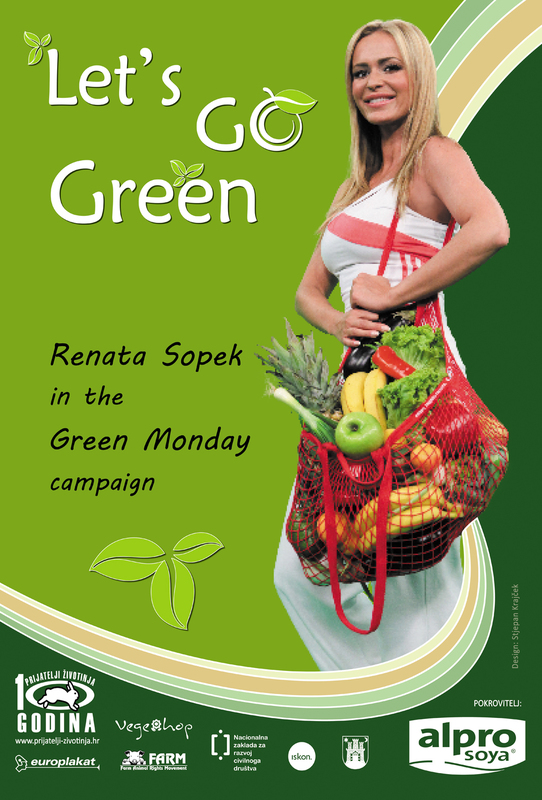 On posters, which will be put up in Zagreb, offering a bounty of fresh fruit and vegetables, Renata says: "Let's Go Green." Presentation of visuals and the campaign with Renata Sopek will be held at a press conference on Friday, September 23, 2011, at 11 A.M., at the restaurant Vegehop (Vlaska 79) in Zagreb. A rich buffet of vegan dishes will be prepared for all present. At the shoot, Renata said: "I have beenn dedicated to exercise and a healthy lifestyle for years, which is why I was happy to accept the invitation from Animal Friends to participate in promoting the Green Monday. Anyone can eat fruit and vegetables for one day a week. By eating fruit, vegetables and other plant based foods, we are giving the best to our body, and it is even nicer that we are helping animals and the environment at the same time." Renata Sopek actively advocates preserving and improving health through exercise programs and healthy diet. She emphasizes the value of a diet of fresh fruit and vegetables throughout the year as a simple way to achieve excellent health and ideal body weight. The Green Monday campaign, supported by the Zagreb City Office for Agriculture and Forestry, City Office for Energetics, Environment Protection and Sustainable Development and City Office for Health and War Veterans, aims to encourage citizens to chainge their diet and increase the consummation of fruit and vegetables. This positively affects the prevention of cardiovascular diseases, reducing cholesterol and the risk of some forms of cancer, diabetes and obesity, which are the most common causes of disease and death in Croatia. 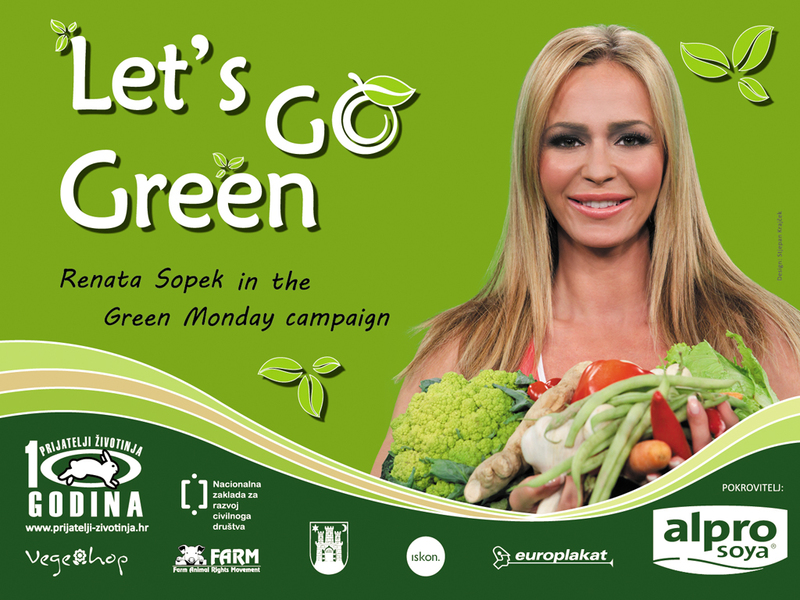 Numerous information on the Green Monday campaign and recipes for many various apetizing plant based dishes can be found at www.zeleni-ponedjeljak.com. There is also the option to sign up for a weekly e-mail newsletter with new recipes. The photographs for the Green Monday campaign with Renata Sopek were taken by Ivan Kralj, posters and postcards were made by Stjepan Krajcek, and it was supported by the National Foundation for Civil Society Development, City Office for Agriculture and Forestry, Iskon, Arto, Europlakat, Vectordesign, Vegehop, Kerschoffset i Farm (Farm Animal Rights Movement). Media sponsors are Zdrava krava and RTL television. The campaign is implemented as part of the Grundtvig Project, under the Agency for Mobility and EU Programmes.